This post is less meaty than I normally do, but I happened to hear about it last night on NPR and thought it was interesting enough to share — mainly because New York City was the first place for this "new" product to appear on store shelves. (As I've written before, NYC is seldom the test market for anything, and new products often appear on supermarket shelves in Omaha or Des Moines long before they do here). What is this "new" product? The product's brand name is Truvia, which is being marketed by food giant Cargill in cooperation with Coca Cola, Inc. — certainly some big marketeing names there. 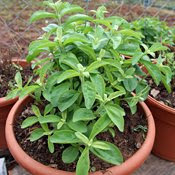 Truvia is a brand of stevia, which is an herb which grows mainly in South America (Brazil, Uruguay, Paraguay and parts of Argentina), but also in more tropical areas of China as well. As David Mendosa wrote about some years ago, since 1994, stevia has been available in the U.S. only as "a dietary supplement". But this peculiar law, offered up by Congress to appease the vitamin and supplement industry, forbade the sale of stevia as a sweetener — the only thing it is actually used for. David announced the business plans for Truvia back in May. This peculiarity of stevia's regulatory status hasn't stopped marketers from making the product available to consumers in convenient, Sweet & Low size-packages, but the main issue was that they had to label it a "dietary supplement", not a sweetener, making things kind of weird, as it used to be found next to the vitamins and not sugar in the store nearest to me. Lawsuits were filed, and it looks like those guidelines have since been relaxed. A brand called Sweet Leaf is widely available in places like Whole Foods nationwide and has been for over a decade. Whole Foods even addresses the peculiarity of this fine example of Washington regulatory intelligence here. It is also relevant to note that in Japan, which had laws banning artificial sweeteners for years, stevia has been widely used as a sweetener for decades, and what's more, it's used by Coca Cola as the sweetener used in diet Coke sold in Japan and South Korea. Perhaps that explains Coke's interest in merchandising the product here. However, until this latest move, the distributors have been small, cash-strapped companies who really did not have the ability to bring the product to customers everywhere. So, what does it taste like? In my own experience, I've found stevia-based sweetners to have a slightly licorice-like flavor, and frankly, I didn't much care for it. However, its worth noting that it does differ depending on the preparation and who is selling the product, and I haven't yet tried the Truvia branded product. To offer consumers the "First Taste Moment" of Truvia natural sweetener, the new zero calorie sweetener, Cargill opened the "Truvia Greenhouse" at Rockefeller Center which is there until July 11 (tomorrow) in New York City. The greenhouse coincides with the initial retail availability of Truvia natural sweetener at select D'Agostino supermarkets in New York City. Forty-count packages of Truvia natural sweetener are also available for purchase online at www.truvia.com for $3.99 plus shipping/handling. Apparently, the greenhouse is serving as the centerpiece of an educational exhibit detailing the journey of this natural sweetener from stevia leaf to tabletop sachet. Thousands of stevia plants were grown especially for the greenhouse and brought into Rockefeller Center for the event. At the greenhouse, beverages sweetened with Truvia tabletop natural sweetener, as well as samples of the new tabletop product, are reportedly available. "The Truvia greenhouse offers a hands-on opportunity to discover how this product makes its way from the field to the consumer's table. The result is a new, great tasting, zero calorie product — Truvia natural sweetener," says Steve Snyder, vice president, Cargill Health and Nutrition. "Made with rebiana, the best tasting part of the stevia leaf, Truvia natural sweetener offers consumers zero calorie sweetness in their favorite foods and beverages." The Truvia greenhouse is free and has been open to the public since yesterday, from 7:30 am - 6:00 pm with the same hours tomorrow. Cargill plant experts are on hand each day to discuss how Truvia is made, how stevia plants are grown, and its potential for use in food and beverages. The Cargill plant expert talks will occur today and tomorrow at 11:00 am and 3:00 pm. As of right now, Truvia can be found in certain D'Agostino supermarkets in NYC, or supposedly, you can order it from their website — although I found it a bit hard to navigate the site and locate their store (hint: click on the "FAQ" page). But look for it in other stores nationwide soon. Who knows, perhaps we'll start seeing Truvia in the Starbucks fixins bar in the not-too-distant future? Truvia is the most perfect consumer rip-off in history. That the FDA approved truvia and not stevia is solely to allow Cargill to sell the only sweetener allowed in the bzillions of sweetened products (baked goods, kethup, spaghetti sauce, frozen foods, ice cream, etc). I tried to sell ketchup in the 70's made with honey and was nuked by them. They have perverted the standards of identity 180 degrees from the original regulatory protection of consumers to become a monopolistic profit guarantee. Originally the standard of identity regulations meant that at least n% meat had to be in canned beef stew, n% fruit juice in fruit juice, etc. In the 70's they sued me for making ketchup with honey sucessfully preventing me from calling it honey, although the original standard of identity regulations were to guarantee that you could find more tomatoes than sugar in your ketchup. Now that they have spent countless millions to prevent stevia from being called a sweetener, they slap a brand name on it and stevia can be used in anything, as long as it is CARGILL's stevia. Buying stevia at the health food store will not help - no one can make candy with it, etc. You have to pressure congress to stop this rip-off of consumers and grant of monopolistic rights to Cargill.